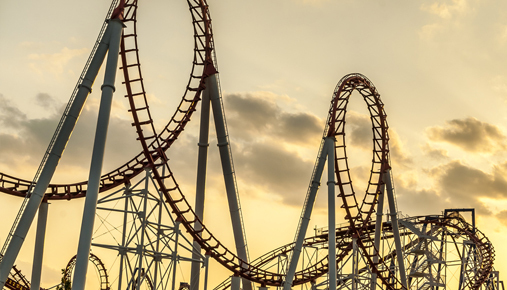 Market volatility picked up a bit during the first week of April, but underlying investor sentiment seems to have turned generally unworried once again. On the one hand, the S&P 500 set a series of new highs for 2016 last week. On the other hand, barometers of market volatility, like the CBOE Volatility Index (VIX), are easing once again. In fact, one volatility indicator dropped to its lowest levels in more than a year last week. 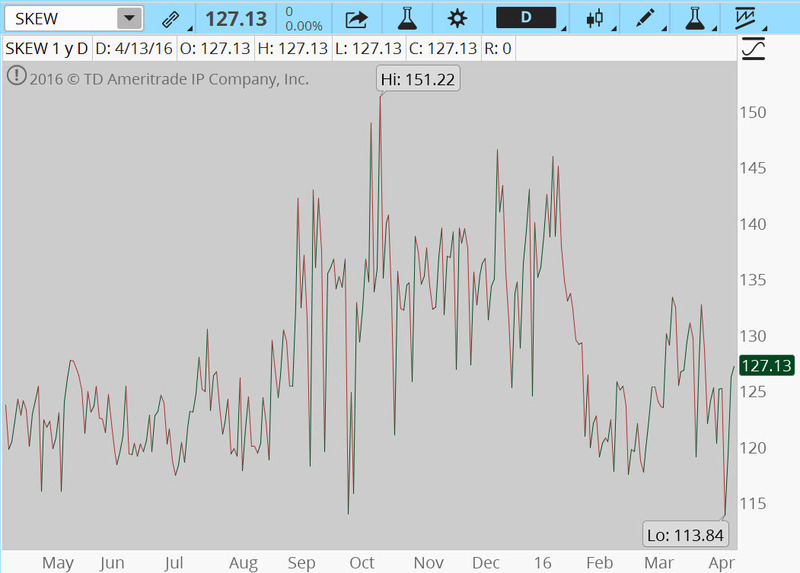 The CBOE Volatility Index was at 2016 lows near 13 on April 1 before staging an impressive one-week rebound. By April 7, the market’s “fear gauge” was approaching 17. The nearly four-point (28%) jump had some market watchers like me wondering if the relatively slow market action in late March was a calm before the storm. After an uptick in the first week of April, VIX is back toward the lower end of its 2016 range. Data source: CBOE. Chart source: the TD Ameritrade thinkorswim® platform. For illustrative purposes only. Past performance does not guarantee future results. 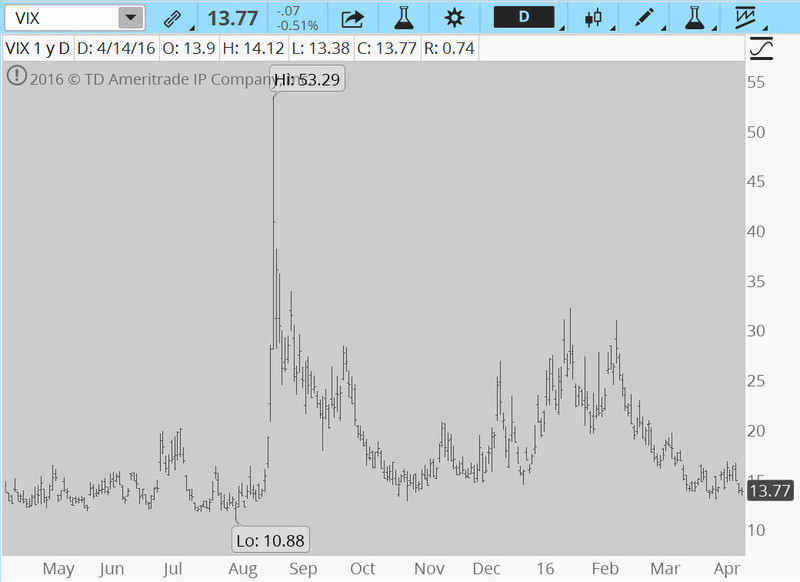 Yet, as we can see from figure 1, VIX was back under pressure and falling below 14 through mid-April. Recall that the index tracks the expected, or implied, volatility priced into S&P 500 Index (SPX) options. It’s now well off the highs of over 30 seen just two months ago. In fact, VIX is once again probing 2016 lows. Not only is VIX at the lower end of this year’s range, but there has been a notable drop in the implied volatility skew in certain S&P 500 Index options as well. To be specific, it appears that lower-strike puts on the index are getting less expensive relative to higher-strike call options. Figure 2 shows the recent spikes in SKEW in October, late December, and early January. During those times, players were probably showing greater interest in deep out-of-the-money (OTM) puts on the S&P 500, and skew increased. That is, players were willing to “pay up” for puts that have strike prices well below the current market to help protect against an unusual or outlier event, sometimes called “tail risk.” The skew index has come down sharply since then and, as we can see in figure 2, it fell to 52-week lows of 113.84 last week. That marked the lowest reading since October 2014. FIGURE 2: THE CBOE SKEW INDEX. It’s falling to low levels, too. Data source: CBOE. Chart source: the TD Ameritrade thinkorswim® platform. For illustrative purposes only. Past performance does not guarantee future results. Skew can have important implications for options traders, and keep in mind that it can vary greatly depending on the underlying instrument. For instance, the skew on the S&P 500 Index is likely to be different from the skew in options on an individual stock or commodity. In this case, the SKEW Index suggests that put options premiums (far OTM) are seeing a decline in implied volatility, but this applies only to the S&P 500. The low skew readings might be a sign that portfolio managers and other players in the index market are not aggressively taking positions in S&P 500 puts to hedge stock positions. This, of course, would stand in stark contrast to the sentiment early in the year, when SKEW was at 145. You probably read this column weekly because, like me, you’re fascinated by market volatility and what makes VIX tick from one minute to the next. But don’t you wish that you could see it move anytime, day or night? Now you can. So now when you get up at 3 a.m. for a glass of water or to let the cat in, you can also check your smartphone to see what VIX is up to. Editor’s Note: As of October 3, 2016, RED Option is now TradeWise. Earnings season is here, and it may bring some interesting options opportunities. The equity markets have rallied from their mid-February lows, and volatility has fallen sharply as uncertainty concerns abate. This causes option premiums to contract, because downside risk may be overlooked on the back of higher equities. Opportunities in risk-defined options strategies such as short verticals and iron condors are pretty thin in the major indexes and ETFs. The one glimmer of hope is that earnings season is here, so individual stock volatility could rise going into quarterly reports. The short iron condor is a popular option strategy that many seasoned options traders use to try to take advantage of higher volatility on a range-bound market or stock that they expect will remain neutral. Increased volatility expands the option premium collected, and potentially widens out the short verticals for better probabilities. The iron condor strategy involves four different contracts, or legs, surrounding the current price of the underlying. A short iron condor is constructed by selling one call vertical spread and one put vertical spread (same expiration day) on the same underlying instrument. They are typically both out of the money, and are an equal width apart. There is no inherent bullish or bearish bias when selling an iron condor unless either vertical is skewed closer to the underlying instrument’s price. The credit collected on the iron condor is the potential profit. This is why high volatility provides good iron condor opportunities—as option premium expands, the amount collected increases. How can a trader profit on a short iron condor position? To maximize this neutral strategy, the underlying security needs to remain in a narrow trading range until expiration. When expiration arrives, if all options are out-of-the-money, they expire worthless and the trader keeps every penny (minus transaction costs) collected when they sold the iron condor. Conversely, the risk is if the underlying security does not remain in a narrow trading range and instead trends up or down. This may cause some of the options to expire in-the-money and result in losses (plus transaction costs). Don’t expect that ideal situation to occur every time, but it can potentially happen. Typically, we prefer to close the iron condor position as close to expiration as possible for less than the amount we collected. This eliminates the risk of the underlying security moving significantly ahead of expiration. Time decay (theta) works in our favor, too, as the short verticals that comprise the position lose time value each day into expiration. You can learn more by watching this video example of an iron condor. Spreads, iron condors and other multi-leg option strategies can entail substantial transaction costs, including multiple commissions, which may impact any potential returns. These are advanced option strategies and often involve greater risk and more complex risk, than basic options trades and are not suitable for all investors. Get step-by-step TradeWise trade ideas from former floor traders delivered directly to your inbox. At checkout, enter coupon code “ticker”. *When the two months have passed, keep the RED Option service for just $20 per strategy per month. RED Option Advisors, Inc. and TD Ameritrade, Inc. are separate but affiliated firms. Advisory services are provided exclusively by RED Option Advisors, Inc. and brokerage services are provided exclusively by TD Ameritrade, Inc. For more information about RED Option, please see ADV 2 on www.redoption.com.